The REV’IT! Sphinx H2O are the perfectly matched rain trousers for the Nitric H2O rain jacket. 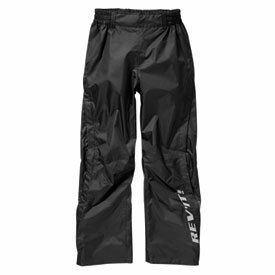 They’re equally well equipped with mesh inner lining and feature a full-length, two way easy-entry zipper at the left leg and an easy entrance zipper at the right leg, as well as additional reflective panels for enhanced visibility. Wrapped in a practical stowaway bag, these trousers can be simply integrated into the existing rainwear display. Outer Shell: PVC-free PWR | Oxford with PU coating. - Outer Shell: 100% Polyester (100% Polyurethane coating). Adjustment tabs at waist and ankles. PVC-free, elastic at waistband, two-way easy entrance zipper with water catcher at left leg, easy entrance zipper with wind catcher at right leg, belt loops, includes transport bag.